I grew up in Sackville, a town in New Brunswick, one of the Maritime provinces of eastern Canada. Sackville is a lovely little town with Mt. Allison University and a population of about 5400 people. It is situated just 50 kms away from Springhill, Nova Scotia, where Anne Murray grew up. I remember loving her music and being in awe of her. I played her Snowbird over and over again and never grew tired of listening to it. Anne put our side of Canada on the map! I’m sure I wouldn’t find a Maritimer who wasn’t proud of our Anne Murray! My family of Mum, Dad and my sister Lorraine didn’t play music together, although Lorraine played the piano and Mum loved to sit down at the piano or organ and play by ear. It looks like my prowess in music may have come mainly from my Mum’s family and some from my dad’s family. Dad died in 1977 and we had never talked much about his family, but I’m told that he had a few muso relations. So I guess some of my interest in music may be inherited, but I know that I owe a lot of my love and success in music to the environment that I grew up in. The first instrument I played was the violin. As a kid of about 5 or 6, I was part of a violin group in town that was given an opportunity to perform live on T.V. In those days, live really meant live, so we couldn’t watch the performance after we finished playing. My memory of this performance was of me playing my violin and having an itchy spot on my leg just below my knee. So, as we all know how good us girls are at multi-tasking, I scratched my itchy leg with my other foot, (and didn’t miss a beat with my playing!). The camera was straight on me at the time and after the performance, I can’t remember my mother commenting on how the performance was, but I do remember her being in stitches of laughter and shaking her head as she described my balancing act. So there it was – my career in music was kick-started! A few years after starting the violin, I began playing the piano, and loved it. We had a songbook with all the hits of the time that I liked playing during the next few years and Mum loved to hear me play some of her favourites like Five Foot Two, Moon River and The Beatles’ Yesterday. Sometime between grades 4 and 7, I began playing the guitar. Mum loved Tammy Wynette’s D-I-V-O-R-C-E and she always asked me to play that for her friends. I was much happier to launch into my favourites like Where Have All The Flowers Gone and Dylan’s Blowin’ In The Wind! But nevertheless, I did the good daughter thing! 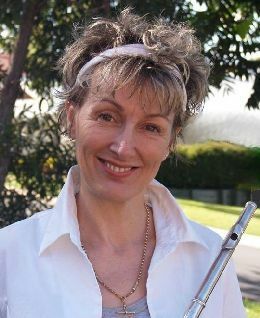 In school, I played the clarinet for a couple of years and then changed to flute – I loved the sound of the instrument. In grade 12, some of my friends and I put a band together and we played in town a bit doing covers like Evil Woman and Elton John’s Daniel. We had a great time! Following high school, I was accepted into university in town and during my 5 years of studying Music at Mt. Allison, I did some recording on ABC radio with the quintet I played in and was a regular performer each winter in the Ice Capades pit band. (Ice Capades is like Disney On Ice here.) But I have always enjoyed the folk scene and started off playing only folk music on my guitar. I just loved Joan Baez, Bob Dylan and Gordon Lightfoot and my guitar was with me just about everywhere I went as a young teenager. Once, I cycled 20 miles to and from a beach with my guitar strapped across my back, and spent a lot of time sitting on the sand strumming and singing with one of my good friends. These days, my flute and penny whistles replace my guitar! In 1979, I moved to Australia and met Brian Brett through neighbours in 1985. He told me he was a guitarist so we had plenty to talk about straight away. We stayed in touch and in 1992 when I needed a guitar player for a concert I was organising for the Nursing Mothers Association, I asked Brian if he would accompany me while I did a couple of numbers on the flute. He said yes and 16 years on, we are still making beautiful music together! Ahem…….! In the mid 90’s, I joined Colcannon, Ann and Jerry O’Neil’s band, with Brian and we played regular gigs with Colcannon for about a year. We then formed Silken Thomas with Ian Evans on bass guitar, (from The Best Music Shop), and we have played together throughout most of the last 12 years. We now have regular gigs in and around Brisbane as a four-piece, with our drummer Steve Stiller, playing mostly Irish folk music and a few non-Irish covers. As well as performing as part of Silken Thomas, Brian and I love to play as a duo and have performed at a couple of Folkies Old and New concerts, at Indigiscapes as part of the Folk Redlands scene, at the Upfront Club in Maleny, and as regularly as we can at the Kookaburra Café Blackboard sessions on Wednesday nights. I also do work as a studio musician and played flutes and penny whistles on a few CD’s, including Anne Infante’s Love Is A Circle and Mark Davidson’s Laughter In the Clay – both great musicians and lovely to work with. Lately, I have been working with Mark Smith (Real Productions) on the recording of a flute CD, featuring my alto flute (the big one!) and my C flute (the normal one!). Mark is terrific to work with, really knows his stuff and has the patience of a saint! My CD is called Notes From Squire Street, (the street I grew on in Sackville) and is an instrumental CD. I have enlisted the help of Brian and a few muso friends to back me on this album and it has been a lot of fun to put together. Release date hasn’t been set yet, but it may have already been released by the time you read this! I guess if I had my time over again, I would play more music. But saying that, there are only 24 hours in a day and I do love my school and private teaching, as well. It’s a real buzz to see and hear how the children improve in their skills, to see their enthusiasm and to hear them sing – what a beautiful sound, the sound of children’s voices! And it always gives me a warm fuzzy when I see some of my students pursuing a career in a music-related field. I’ve got no complaints – my life is music. And when there are some nice bottles of red thrown in too, well, what more could you want?? ?